SUGAR LAND, TEXAS (May 23, 2015) With a stunning six-run eighth inning, the Houston Baptist UniversityHuskies defeated the Sam Houston State University Bearkats by the score of 6-0 to win the 2015 Southland Conference Baseball Tournament on Saturday, May 23, 2015 at Constellation Field in Sugar Land, Texas. With the win, the Huskies advance to the NCAA regional tournament. The game remained scoreless until the eighth inning, when HBU erupted for six runs on six hits to secure the win. Starting pitcher Curtis Jones went the distance for the Huskies, facing 35 batters, and giving up 10 hits, while striking out 7 and walking a single batter. He threw 111 pitches and finished the game with a 3.62 ERA; raising his record to 6-6 heading into the regionals. For his effort, Jones was selected as the tournament’s Most Valuable Player. The Huskies batted through their lineup in the eighth inning, scoring their six runs with two outs on the scoreboard. They lead off the inning with two out before catcher Samm Wiggins drew a walk and first baseman Andrew Alvarez singled. The Bearkats pulled starting pitcher Greg Belton, who threw 7.2 innings, giving up seven hits. Belton was replaced with right-hander Jordan Church who promptly gave up four hits that scored five runs. He was pulled after facing four batters and replaced by Alex Bisacca. The right-hander walked a batter before giving up double and a run. He closed out the Huskies with a strikeout, but by then the damage was done. HBU tallied 12 hits in route to their six runs, all of them earned. Alvarez was 2-of-4 with a single run and two RBI while right fielder Thomas Clay went 2-of-3 with a run. Left fielder Brandon Morones secured two hits and a one RBI. In addition to Jones, the Huskies placed three on the All-Tournament Team. Second baseman Greg Espinoza, right fielder Clay Thomas and Alvarez joined Jones on the elite squad. 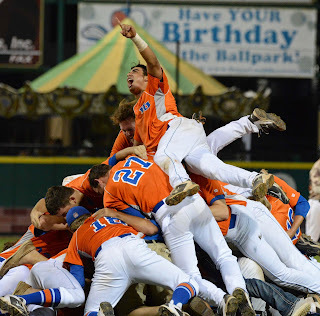 Tournament runner-up Sam Houston State placed designated hitter Jake MacWilliam, outfielders Hayden Simery and Bryce Johnson, along with left-handed pitcher Andrew Godail on the squad. This will be the first time in school history the Huskies have made it to the NCAA post-season. In 2007, they advance to the NAIA World Series, finishing in third place. In 2014, Matt Stonie (San Jose, California), who was the No. 2 ranked eater in the world, down No. 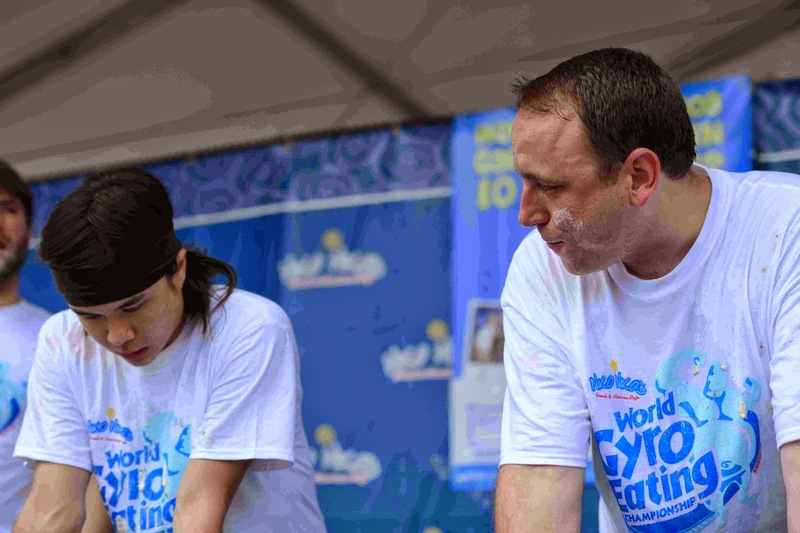 1 Joey Chestnut (San Jose, California) by eating 24 8-oz gyros in 10 minutes. The performance was a new world record, breaking Chestnut’s record of 22.5 gyros established in 2013. The victory was the first for Stonie, who finished in second place in 2013 and 2014, and third place in 2011. Chestnut had previously won the title in 2010, 2011, and 2013. In 2013, Chestnut consumed 21 gyros for second place in 2014, while eating 21 in 2010, where he tied the record established by Pat Bertoletti in 2008. Other competitors eating for the Niko Niko’s Belt include No. 4 Miki Sudo (Las Vegas, Nevada) and No. 16 Steve Henley of Dixon California. Sudo placed fourth in 2014. Consuming 11.5 gyros in the 10 minute limit. The event will kick off at 2 p.m. with tickets costing $3.00 each.